With the advent of rapid industrialization, India’s energy consumption has increased significantly. According to BP Statistical review of world energy 2014 (http://www.bp.com/content/dam/bp/pdf/Energy-economics/statistical-review-2014/BP-statistical-review-of-world-energy-2014-full-report.pdf) the country’s primary energy consumption increased by 70 % from about 345 mtoe(millions tons of oil equivalent) in 2004 to 595 mtoe in 2013.However the energy mix has not changed much as in present day scenario also, the major source of energy is non-conventional sources of energy. 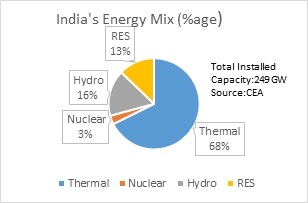 Although there has been significant increase in the share of Renewable sources of Energy, but there is a long way to go for Indian power sector to increase the dependency on RE sources of power. Given the paucity of fossil fuel sources of power generation and their adverse impact on the environment through GHG emissions, it is domineering to formulate the policies that are more related to the sustainable development. The role of Energy efficiency has gained significance in the recent times because ample amount of research as well implementation work has been done at the Generation side of the power sector. The country’s energy conservation potential is estimated at around 23% with industrial as well agriculture sectors having the majority scope of efficiency enhancement. Taking this into account government launched the Perform, Achieve and Trade (PAT) scheme in July 2012, which is aimed at accelerating the energy efficiency in the industrial sector. 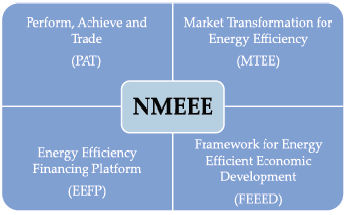 PAT is the flagship scheme of the National Mission on Enhanced Energy Efficiency (NMEEE) which was launched in 2008.This is a market based mechanism to enhance cost effectiveness of improvements in energy efficiency in energy intensive large industries and facilities, through certification on energy savings certificates (ESCerts) that could be traded. In its first cycle that extends from 1st April, 2012 to 31st march, 2015, PAT covers industrial units in 8 energy intensive sectors which account for around 60% of the India’s total primary energy consumption. The 8 sectors include Power, Fertiliser, cement, pulp and paper, textiles, chlor-alkali, iron and steel and aluminum industries which consumer high energy than the threshold levels thereby raising an alarm bells. The same units have been identified as DCs (Designated Consumers) Under the PAT scheme, these DCs (478 in number) are expected to achieve energy savings of 6.686 mtoe of which more than 80% us expected to come from the thermal plants, iron and steel and cement sectors. PAT Reporting Requirements: BEE being he nodal agency for the PAT program formulated the guidelines for the PAT scheme after exhaustive workshops and consultations with the industrial players. The data submitted by DCs through various forms is an integral part of establishing the targets. The DCs are also required to follow mandatory reporting requirements for the entire PAT cycle. As a first step, DCs were required to submit the action plan to the respective SDAs (State Designated Agencies) by June 2012 ,which included proposed energy savings along with estimated investments and subsequently the energy savings are replied back with filled Form 1.Meanshile a performance assessment document, Form A to need to be submitted to the SDA and BEE once in three years. After the submission of Form 1 and Form A, the DC is required to hire accredited Energy Auditor (AEA) from the list of BEE-empanelled AEAs for the verification of the forms submitted by the particular industry. A submit of verification Form B is submitted to the SDA and BEE by June 2015.After proof reading the documents by BEE, ESCerts will be recommended by Ministry of Power by August,2015.Trading of ESCerts will be done through Power Exchanges. Diversity of DCs: The biggest implementation challenge is the diversity of DCs in terms of their energy profile, processes and technology deployed as well as their end products. This leads to cumbersome process of settings benchmarks for the various DCs. Factoring most efficient technologies: In order to bring at par, most efficient technologies need to be accounted too for credible benchmarking. Lack of Skilled Manpower: It has been observed that there is a dire shortage of skilled manpower in the sector which can lead to the betterment of the energy efficient sub sector in Indian context. Lack of Energy Accounting Infrastructure: Due to lack of efficient and stable energy management infrastructure, there is a need to step up the morale of the investors in this regard too that is perhaps the first step towards the energy reduction roadmap. BEE being the nodal agency for the PAT scheme need to very stringent on its guidelines and road map issued to various DCs. Although the scheme is still in nascent stage but if the things are not kept in line at this point of time, then it might defeat the sole purpose of designing the PAT scheme which will lead to sustainable INDIA. References : CEA,Power Magazines,CERC, BEE and various popular print media concerning power sector. This entry was posted in Energy Efficiency and tagged BEE, Energy Efficiency, ESCerts, Nodal Agency, PAT, Perform Achieve and trade, Power Exchange, SDA.